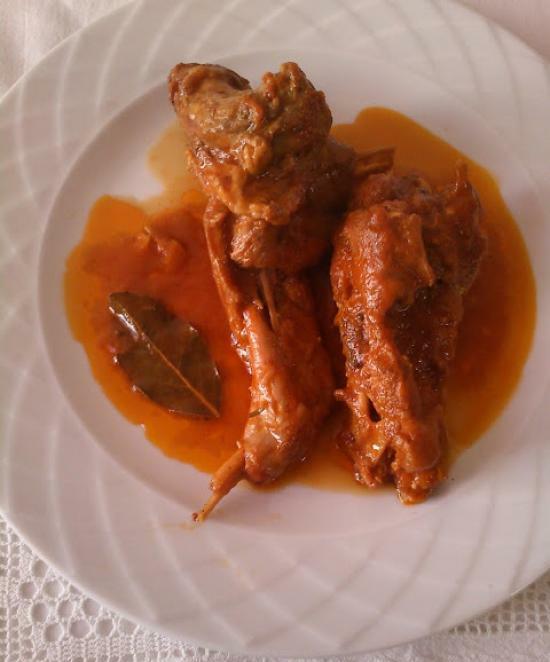 This dish is traditionally made with wild hare in Cephalonia, but in its absence rabbit is often used. The name lagoto (lago means “hare” in Greek) is also found in parts of the Peloponnesos, where it refers either to a dish of hare or rabbit thickened with skordalia or, oddly, to pork stewed with skordalia. 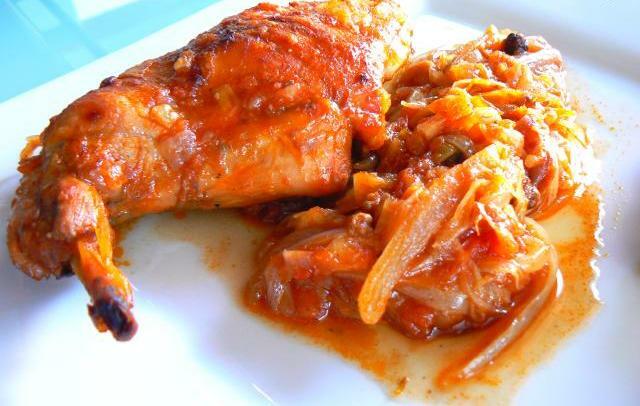 The Cephalonian version of lagoto is a good example of some of the similarities in the cuisines of the Ionian and the Peloponnesos. Cephalonia, especially, since it is the closest island, shares much in common with the tables of the western Peloponnesos. One such common thread is the use of tomato paste, rather than fresh tomatoes, as seen in the recipe below. Another is the marriage of the lemon to the tomato, a combination unusual for almost all of Greece except the Ionian Islands and the Peloponnesos. As for the boiled garlic, that is a technique that appears to be unique in the Ionian. Boiling mellows the garlic, making the use of two whole heads easier to understand. 1. Wash the rabbit and cut into serving pieces.Marinate it in the vinegar and peppercorns in a glass bowl or dish, covered, in the refrigerator overnight. 2. Remove the rabbit from the marinade and pat dry. Set aside. Meanwhile, place the unpeeled heads of garlic in a small saucepan with just enough water to cover and bring to a boil. Simmer until the garlic is soft, 15 to 20 minutes. Remove from the water (do not discard the garlic water), let cool slightly, separate the cloves, and squeeze out the pulp. 3. Heat the olive oil in a large Dutch oven or flameproof casserole over medium-high heat and add the rabbit, turning to brown on all sides. Remove from the pan. Add the garlic pulp to the hot oil and stir for a few seconds. Add the diluted tomato paste and stir for a minute. Return the rabbit to the pot, together with the reserved garlic water. Add enough additional water to cover the rabbit. Season with salt and pepper. Bring to a boil, then reduce the heat to medium-low and simmer the meat for 30 minutes. Add 1?2 cup of the lemon juice, cover, and continue to simmer until the rabbit is tender, another 30 to 40 minutes or so. Just before removing from the heat, adjust the seasoning with several tablespoons of the remaining lemon juice and salt and pepper.